My 2009's PCM recently started to randomly re-boot. It doesn't do it often enough for the dealer to replicate. In the meantime, they decided to try updating the firmware to the latest version. They first installed version 1.47, then tried to install 2.24. They said that they got some sort of disk read error message. It didn't occur to me at the time, but I was wondering whether they tried to update the firmware by putting the disk into the PCM, rather than loading the disk into a laptop. Do all PCM 3.0 firmware updates go through a laptop, or do some earlier ones get updated by putting disks directly into the PCM? As always, TIA for your help! In the meantime, they decided to try updating the firmware to the latest version. Sorry can't help whether the updates go through laptop or not. 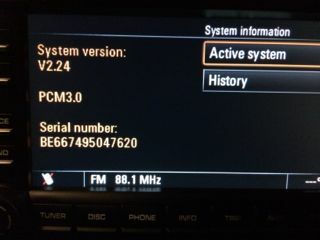 But during my service last Sept, I asked my SA to update the PCM since the bluetooth would pixelate from time to time. His advise was to hold off as the update was causing more problems than it solved. Anyone do a recent update? I'd like to know if it is safe to try again for the update. ...Anyone do a recent update? I'd like to know if it is safe to try again for the update. In late December I was updated to V2.24. It also includes the 2014 Navigation updates. I have had no problems. In regards to OP, it does seem that there is some failure beyond one attributable to the software. I'd guess a hard drive failure is not unlikely. I was told that the updates were done via laptop. The error message they received was something like "media unavailable for this vehicle" or similar, even though the disk says its for the PCM 3.0 unit. The service tech said that they couldn't replicate the rebooting issue, so they couldn't replace the PCM unit. But, if the PCM isn't able to load new firmware, wouldn't that be a reason to replace the unit? I upgraded to v2.23 with a 2013 map update last July. My dealer had a hell of a time installing it but I have had no difficulties. The only irritating issue is there is new map functionality but NO documentation. So you have to push buttons and see what happens. Not sure if related, but I have a recurring issue with reboot of the PCM in my 2009 TT. It happens when my iphone5 with iOS7 has bluetooth enabled. I can reproduce at will - turn off Bluetooth on phone, it's fine. Turn it back on, will reboot periodically. Did not occur prior to the upgrade to iOS7. Dealer upgraded firmware and it did not help (not sure what version, but think it's in the 2.2x range). I suffer the same reboot problem on my MY 2010 997.2. It appears to be triggered by proximity to high powered Mobile phone base stations. It would appear that the PCM system may be inadequately shielded from Electromagnetic interference (EMI) and is susceptible to radiated interference at particular frequencies, in this case from the mobile towers (3G, 4G). Also had the same problem with my BMW 335i at the same location but BMW resolved it with a software update (presumably they trapped the interference induced reset and circumvent it in some way) although Porsche have said we simply need to accept the issue ("they all do it sir!"). Anyone suffered this issue and heard of a fix from Porsche? It appears systech may have the answer. If this is it, I guess you could get repeat failures by driving by the same location multiple times. It would also confirm if it is EMI. In any case, with in-car video cameras so pervasive these days maybe you have a camera you could train on your display full time until it happens... then show them the video. Of course, its no telling if they would accept it or not. The video would validate it happens, but not provide the techs the ability to reproduce the problem in their attempt to troubleshoot. If it means they have to have the car in a particular location, that does help in that it must be something external interfering with the car. Fixing that would be problematic. If its bluetooth in ios7, then Apple must have done something odd that Porsche's bluetooth system wasn't prepared to handle (bad programming on someones part). That could be fixed in the car, if the car's bluetooth stack were configurable via a firmware flash. UPDATE: Dealer and Porsche concluded that something was wrong with the PCM 3.0 unit because it would not load updated software. Replaced PCM, then amplifier stopped working - no sound. Now, new amp on order. Anyone had a similar experience? With the host of needless interlocks and authentication passwords and whatnot that Porsche put in the design just to be able to tightly control what parts go where and be sure they are paid for them, I think that process gets in the way of properly functioning cars quite often. It could be some authentication isn't just right (because that process relies on something that changed - eg the amp needs to be re-authorized for the PCM), to there being a slight issue with the connector between PCM/AMP, to the service tech being unfamiliar or missing one of a host of steps to get it all hooked up and working again after PCM replace. Further update: they installed new PCM unit and new amp, and everything seemed to be ok. I picked up the car and ran through some of the settings. I noticed that some of the features you can access from the steering wheel stalk are missing - no "phone" setting, no "audio" setting. And, the cruise control now doesn't work. Incomplete programming? More features missing from "stalk" control - no sport chrono, no nav... It's got to be that someone didn't tick these features when programming the unit. Likely they didn't reenable/program the features with the new unit. I am so glad the 2010 GT3 I'm purchasing doesn't have Nav or Bose.